Some good news for Mets fans. It's looking less and less likely that we'll have to worry about another end-of-season collapse. Downtown Manhattan: a study in architectural contrasts. At the bottom center of this photo (taken from the Manhattan side ramp of the Brooklyn Bridge) is the upper portion of an architectural gem, identifiable by its circular windows near the top: the twenty five story 80 Maiden Lane, originally, when completed in 1912, called the "Fire Companies Building." 80 Maiden Lane was designed by Daniel H. Burnham, whose other great surviving New York commission is the Flatiron Building. 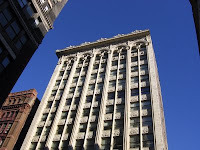 To my eye, Burnham's design for 80 Maiden Lane shows the influence of his fellow Chicagoan, Louis Sullivan, whose sole New York design is the graceful Bayard-Condict Building on Bleecker Street (photo at left). Bracketing the visible portion of 80 Maiden Lane, but actually closer to the Bridge, on John Street, are two art deco office buildings exemplifying the "wedding cake" or "ziggurat" style that prevailed in New York from the early part of the twentieth century until the 1960s, when the zoning law was changed to encourage slender towers with adjoining plazas instead of buildings that took up the entire lot at their base and then had successive setbacks on upper stories to allow light to reach street level. The building toward the right of the photo is in the more ornate deco style prevalent in the 1920s and 30s, while that on the left is in the austere style typical of post-World War Two buildings. On the right edge of the photo is the eastward facing facade of the neoclassical Royal Insurance Building, designed by Starrett and Van Vleck and completed in 1927. Behind, and looming over, 80 Maiden Lane is 60 Wall Street, now the U.S. headquarters of Deutsche Bank. This tower, designed by Kevin Roche, John Dinkeloo and Associates and completed in 1989, is typical of the "postmodern" style, incorporating neoclassical elements, that was typical of the last two decades of the twentieth century. The one twenty-first century building visible in this photo is the garish chrome yellow residential condominium William Beaver House, a small part of which is seen above and to the right of 80 Maiden Lane. Louise Crawford of OTBKB to teach blogging class. If you're considering starting a blog, or have recently taken up blogging, and live in the New York City area, you may benefit from attending a class to be taught by Louise Crawford, of Only the Blog Knows Brooklyn. It will meet at the Brooklyn Arts Exchange ("BAX"), 421 Fifth Avenue (at 8th Street), in Park Slope, Brooklyn. The class will meet on three successive Wednesdays starting at 7:00 P.M., beginning tomorrow, April 29. The fee for all three sessions is $45. I regret the short notice, but this is a sterling opportunity for novice or aspiring bloggers. Louise is to blogging what Emeril is to cooking. Taken from the Manhattan Bridge pedestrian walkway, April 25, 2009.